After my repair of a stereo receiver I learned the basics of amplifier repair, and operation (actually, I’ve learned a ton since then). Step zero, if you can, is to find the schematics of the device you’re going to be working on. 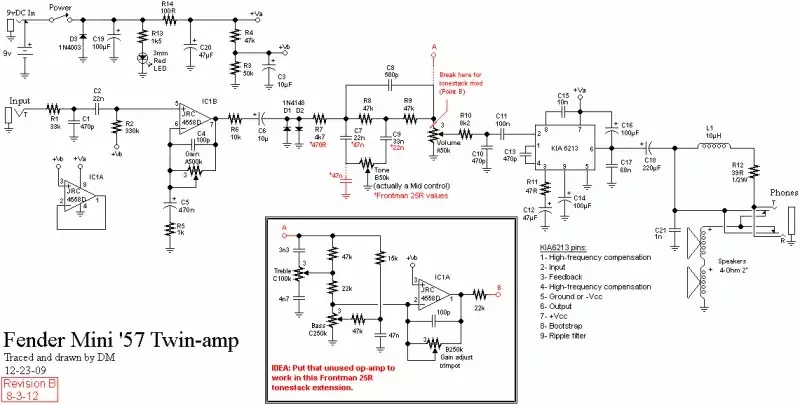 Unfortunately, Fender doesn’t have the schematic on their schematics page here. I’ve emailed them to see if they can provide them, but have not yet heard back (I have since heard back, and they did not have the schematic. Their thought being this was an outsourced design, and schematics were never provided =/). So, not finding them there, I Googled a bit, and similarly couldn’t find them. I did, however, find a schematic for the Fender Mini ’57 Twin® here. That schematic is also the one to the left (hosted locally for posterity), and from my basic spot checking, appears to be the same board as the Mini Tonemaster® (same ICs, same cap/resistor values, speaker load, etc (though it does appear the board I’m working on does not have L1)). It would appear the only real difference is the enclosure 1. So my first step, really, was just divide and conquer. Using my bench PSU (since the amp uses a standard 2.1mm power jack (albeit wired backward (positive shell)), I wired up the amp and found it draws about 10mA quiescent current at 9V (mind you, my PSU is only accurate to 10mA). This is probably mostly the red power LED, though on power up my PSU does briefly go into Current Limit mode (I set it to 200mA max since that’s what the amp says it draws from it’s power supply). Next, I wired the unit up to my Function Generator with the positive lead on one end of R1, and the ground to ground. Now, using my scope, it’s a simple matter of testing along the path of the signal to figure out where it disappears (as well as how it changes with each of the control potentiometers). Which, in this case, it disappeared shortly after the volume control (which means at the main IC). Figuring this was bad, I pulled it and set up a test circuit for it on a breadboard (that circuit is on the left). And, nothing. Maybe a very tiny amount of passthrough, but certainly no amplification. So, IC dead. Given the fact that diode was blown, my guess is that the battery got inserted backward, and because of how they wired the protection diode (wrongly, I would argue), it blew open (rather than closed) and took the IC with it (once it was open, it no longer protected the circuit). Tracking down a replacement to the KIA6213 led to several newer ICs, but all of them were $10+. Finally I found the NTE1465, which was $2 on eBay (from Radioshack of all places) with free shipping. I ordered two, and waited. I also added a socket to the board so I could just drop the replacement IC in… sadly, it would turn out that the IC would not fit snugly in the socket, and would slip out/cause dropout). New ICs showed a week later, and after a few moments of soldering it in, I fired the unit up, and it worked great. Must say, the “gain” nob, when used for playing music, is FAR too touchy. But, that makes sense given the 500k pot on that op-amp. And given the amp is for guitar, overdriving the amp gives a desired sound, where overdriving music just leads to clipping and distortion. Hopefully this will help someone fix one of these amps in the future. Hi there. I use these in stereo on my board an use them on clean. I dont care for the gain. Do u knw any ways of improving the amp? New better components for headroom etc?